Sometimes Fuego is almost to much of a beauty. Time lapse photography of the 2015 New Years Day Eruption. First of all, this article is the official start of our celebratory week and we have no less than two things to celebrate since our five year birthday as a beacon light of volcanic science is on Wednesday. More about that later in the week, first we have another jubilee to take care of. A year ago to the day we started our attempt to re-invigorate the Decade Volcano Program by suggesting a new set of volcanoes. No other series of articles that we have published has had such an impact and over the year that has passed interest in our suggested volcanoes has surged and in a few cases new studies and new equipment has been installed at our suggested volcanoes. This makes us proud since our intent was to raise awareness of over-looked and under-studied volcanoes that pose a threat to large amount of people, because in the end our only protection against major volcanic events is knowledge. Back when we planned the series we made a list of ten volcanoes, but one of them disappeared from the final list. The reason for this is awkwardly mundane, and it is time to rectify it and add a final eleventh volcano to the list at a shared second position together with Apoyeque. Yours truly during an expedition counting smaller caldera eruption on the flank of the caldera wall, always best to do that from a boat. Lago Amatitlán 2015. Photograph Carl Rehnberg. Visible are Agua and quite a few lava domes and to the right is a gauged out mini caldera. The mundane reason is that in the middle of the series I suffered from a small stroke (the first out of two) and Albert and Henrik got stuck with finishing the list (and they did a brilliant job out of it). There are two reasons that they changed the second placed volcano with another, first of all there is a lack of articles written about my suggestion for a number two, and the second reason is that it is my own home-turf volcano. It was also the intent that I would write an additional piece, and what better time than at this anniversary. As a part of our celebration we have permanently added the list at the top menu of Volcanocafé under the header NDVP. But, before we get started let us have a reminder of what the prerequisites was to get included in the list. The first thing was that we should give under-studied volcanoes an advantage. The second reason was that they should be active in a way that is pointing towards a future large eruption. The third rule was that the volcano should be awkwardly placed in relation to a large amount of people and that we could fairly accurately predict a death-toll from a maximum historic eruption or a well predicted maximum eruption. As such the original NDVP was a chilling read. Now time to go to the worst piece of property on the planet. One last thing, I have written an article before that relate to this volcano and I recommend reading it again since it will go through previous disasters of Guatemala City in more detail. Agua, the bane of the second capital of the colonial Guatemala. Photograph by Oscar Velasquez. No country on Earth has had as many capitals destroyed by natural disasters as Guatemala. To date 4 capitals has been destroyed a total of 8 times through 6 earthquakes, 1 lahar and 1 major eruption. Let us go through the list from the latest to the oldest destruction. The last time Guatemala City (the current and fourth capital of Guatemala in less than 500 years) was destroyed happened during the M7.5 earthquake from the Mixco Fault in 1976. This caused 23 000 fatalities, 77 000 injured and made 1 200 000 people homeless and the rebuilding of the city is pretty much an ongoing project to this day. Before that Guatemala City was hit by a prolonged swarm of major earthquakes between 1917 and 1927. I have previously covered this in an article that can be found by following the link above. Prior to that the capital of Guatemala was the third capital after colonization bearing the grand name Ciudad de Santiago los Caballeros, nowadays known as Ciudad Antigua de Guatemala, today it is the only remaining intact Spanish colonial city in the world and it is UNESCO World Heritage Site. Oddly enough the city was partially saved for our viewing pleasure by being destroyed by no less than 3 earthquakes. The first one was the M7.4 1717 earthquake of Antigua, the next one was a M7 in 1751 and the final strike was the Santa Maria Earthquake of 1773 that had a magnitude of 7.5. For those of us who love pretty historical sites where you can sit with a drink and watch eruptions this is the place to be and I really recommend a visit. A gauged out calderito of Amatitlán. Before that the location of the capital was located in the village of Ciudad Vieja, while it was the capital of Guatemala it was better known by the rather stupendous name of Ciudad de Santiago de los Caballeros de Goathemalan, and just to confuse things it was the second capital of the same name. In 1541 it was destroyed by a non-volcanic lahar emanating from Volcán de Agua. It has erroneously been reported as a crater lake failure in older literature, but that crater lake had already drained in another direction prior to the deadly lahar. Instead the lahar happened after an unusual long rain period where down-flow from the slopes of the volcano had been dammed by rocks and trees. This happens often around volcanoes, but it is one of those hazards that are often over-looked. As the first capital of colonial Guatemala was slowly starting to recuperate a second disaster struck, this time in the form of a moderate sized earthquake, this time the residents and colonial authority had it and the city was moved to Antigua in 1543. Now some of you will be pondering what happened to that furtive first capital named Ciudad de Santiago de los Caballeros de Goathemalan? Well, it was placed on an old Mayan capital named Iximche and the Mayans took offence to this and made life seriously miserable for the Conquistadores, so much so that they moved it after just 3 years, so it was not destroyed in a natural disaster. For those interested it was the capital of the Kaqchikel Mayans from 1470 to 1524 when the Conquistadores invaded the place. Now it is time to go back in time to a period prior to the Conquistadors colonizing the local population to near extinction with guns and measles. Back in the dark ages while Europeans muddled around in mud pits thumping their foreheads with bibles Guatemala was the epicenter of one of the greatest High Civilizations on the planet, The Mayan Empire. Few civilizations have achieved such heights of art, culture, literature and architectonics. If you decide to go to Guatemala I highly recommend a visit to Museo Popol Vuh for the art and culture parts and to the Kaminaljuyu Park that is roughly 1 kilometer away from my mother in-laws house. In that park there is a highly intriguing archaeological dig that is open to the public for a small fee (free of charge if you are a Guatemalteca). As you enter into the rather unassuming corrugated roof coverage you get the dizzying experience of standing looking DOWN the side of a Mayan pyramid. Kaminaljuyu dig site. Wikimedia Commons. As the pyramid was built this was the capital of the South Mayan Area that had built a sprawling city near a rather large lake in what back then was a highly bucolic sloping valley. The city was in prominence from 100BC to 400AD and it is the site where the Mayan Empire had one of its high points during the Miraflores Period. The Mayans got fish and fresh water out of the lake and they farmed the valley for maize and other vegetables. There were also ample grazing grounds for livestock. Living here was so good that they could afford to reach heights of art and culture that still rival anything the western civilization has produced. In the end not even the mighty Mayan Empire could save their capital from destruction. But, for the Mayans it was not earthquakes that spelled the end. The reason for that is quite simply that they knew very well how to build earthquake safe houses. And for those who would guess that a lahar was the end of the city they would be wrong, the Mayans knew about that danger too. Most of our readers know that Guatemala City is close by active volcanoes like Acatenango, Fuego and Pacaya. And it would be a pretty good guess that it was one of those that spelled the end of the Mayan capital. Once again the Mayans was too bright and knowledgeable for that. It would have taken a VEI-6 eruption out of Pacaya to produce anything that would have been deadly for the city since it was well located to not be impacted by the recalcitrant volcanoes in the vicinity. In the end we know that there was no such volcanic eruption during that period. So, where did the ash come from that inundated and filled in the lake completely and that also could cover an entire city with tens of meters of tephra? For an answer to that we need to look at a volcano that they Mayans did not know about. A volcano so big that it took until the 70s before anyone understood the implications of what a large caldera volcano could look like, and what it could do even during a comparatively small eruption. And as chance has it, this large caldera volcano is literally the next valley over. Pacaya with MacKinney cone in the center. Here I should Emediately start with contradicting myself and state that it there is no 100 percent evidence of what volcano is responsible for covering up an entire Mayan capital, just that we do know which volcanoes that was not responsible. So, me blaming Amatitlán is a slight conjecture. It could also have been another close by Caldera system. Still, I will walk through the steps and I will even point finger at the likely feature for the eruption and then we can await future research on the subject. Guatemala has several large volcanic complexes and the second largest is the Amatitlán Caldera. Only the Atitlán Caldera is larger, both in size and in maximum eruption size, to date Atitlán is the only VEI-8 volcano in Guatemala (Maria Tecún Tuff). Amatitlán is located very close to the Guatemala City depression that has formed as an elongated Graben emanating out from the caldera as a spread center fueling the volcanism at Amatitlán, so in a way the city is within the extended part of the Amatitlán Volcanic Complex. On another side a volcanic line runs off perpendicular to the caldera that consists of the Acatenango/Fuego double volcano system, Agua and Pacaya. As such this must be one of the most impressive sideshows of a main volcanic caldera on earth. There are also numerous older volcanic edifices surrounding the caldera that most likely have become extinct (even though one or two may be just long dormant). A major faultline runs through the caldera floor that has created the beautiful Lake Amatitlán, as such it is not a proper caldera-lake like in Atitlán, but it is still a good sign of the high level of seismic activity in the region. It was on the shore of this lake that the 1917 prolonged earthquake swarm started, and the origin was well and truly volcanic and not tectonic. It is not until after a while the swarm turned tectonic and ran off into the city of Guatemala itself. Before that a rapid intrusion uplifted the village of Amatitlán several meters and creating the hydrothermal system that is today powering the thermal baths (serious tourist trap, be warned). You can still track that 1917 earthquake swarm in the form of intermittent earthquake swarms under the Villa Santorini suburb of Guatemala City that is located on the caldera wall itself. The view from my wife’s house at Villa Santorini is pretty much second to none when you wish for caldera watching. I often see people being excited about a few centimeters of uplift at large volcanoes like Yellowstone and I quietly chuckle at their excitement. The reason for my merriment is that I am quite familiar with the amount of landscaping a large volcano can do without erupting. Intrusions of magma or hydrothermal fluid shifts can cause rapid uplift on the order of several meters in a day, or in the case of magmatic intrusions entire hills can come into existence in the span of a few weeks. Places along lakes that was at the water’s edge can all of a sudden be a couple of meters up in the air the next time you visit, and houses can be unceremoniously dunked under the surface of the lake. And sometimes houses can be toppled on the side during the night if the volcano in question is having a slight case of constipation. All of these things happens at Amatitlán without an eruption occurring. Now, seriously compare that to an inch of movement over a year in Yellowstone and call me back when you see ten meters of uplift there within a week. General rule, Large Caldera equates Large Movements. Now, let us get to the meat of the business. As most really large volcanoes Amatitlán itself is not erupting frequently, instead the normal business is attended by its flank volcanoes and among those Fuego and Pacaya are the most prolific together with a few appearances of Acatenango. Agua seems to have gone for a pretty extended nap and is now counted as dormant, but not extinct and may one day erupt again. Among these volcanoes Pacaya is the geographically closest with Agua coming second. Eruptions here occur between once every five minutes to once every 30 years with the five minute thing being more of a general rule. Sunrise over Fuego photographed from Acatenango. Now, remind yourself why are you not here? These eruptions are normally not deadly unless a tourist meanders to close to an active volcanic vent. Sometimes fields and houses are destroyed by lava flows and on rare occasions roof collapses on buildings, sometimes as far away as inside Guatemala City. As the volcanoes ramp up in activity they can be fairly seismically active, something that can destroy nearby houses. Also, lahars and pyroclastic flows can emanate from these volcanoes. The second most frequent type of eruptions emanate from the caldera itself. These eruptions consist of extrusion of rhyolite to rhyodacite lava domes. No such extrusion has been documented, but it is safe to assume that these events are accompanied by large scale seismic activity before extrusion starts. Other dangers from these eruptions would be gas expulsion and localized pyroclastic flows as the flanks of the emerging dome collapses. What sets these eruptions apart from other regular lava dome extrusions is the sheer size of the events, they range from creating hills to what can best be described as moderate sized strato volcanoes (even though they are nothing like a strato volcano). And the area is quite frankly littered with them. These lava domes are either extruded at the caldera floor or along the ring fault around the caldera. Now I will jump over the third most common type of eruptions and instead go for the second most destructive type of eruptions even though they are more infrequent. Guatemalan strato volcanoes are good at producing devastating flank collapse eruptions, in type they are reminiscent of Mount St Helens, but these events are an order of magnitude larger. Last time this happened was the 1902 Santa Maria VEI-6 eruption, and even that was small compared with the collapses of Acatenango and Fuego, and comparable in size to the collapse of ancestral Pacaya in the year of 800AD (that also helped with covering Kaminaljuyu). The collapse of Fuego reached all the way down to the Pacific Ocean and reached a projected size of a medium sized VEI-6 eruption and it is here important to remember that the current edifices are equally unstable and that they are likely to fail again catastrophically. If such a collapse would occur between 100 000 and 1 000 000 people will die either directly or in the aftermath depending on the exact trajectory of the collapse and the pyroclastic base surge. It is though good to remember that events like this happens about once every ten thousand years at these volcanoes. At the same time it is a stark reminder that there is a marked need for studies and more monitoring equipment to study the stability of the flanks of these volcanoes. Admit that you wished for a stary Fuego? 2015 New Years Day eruption. To the best of my knowledge Amatitlán Caldera is the only known large scale caldera volcano that has two different explosive variants of supereruptions. We know of at least 16 eruptions in the last 270 000 years that have been either large VEI-6 eruptions or VEI-7 eruptions. All of these eruptions have been large enough to form either pyroclastic base surges, welded tuffs or ignimbrite flow sheets. The reason for there being two different modes of supereruptions is to be found in the rhyolite lava domes and the reason that they are extruded. The ample size of the caldera and that most of the arriving lava going into the side show strato volcanoes makes it into a perfect breeding ground for pockets of magma to rest in. As an intrusion occur it is most likely that it will reside in the caldera crust and that it will take thousands to tens of thousands of years until a new intrusion happens at the same spot. At the same time the intrusions occur at shallow depth, so the magma will fairly rapidly degas and become stale and unable to form explosive eruptions, or even to erupt at all on its own accord. But, sooner or later fresh volatile rich magma will arrive to the same spot where the rhyolitic mush resides. Here the respective volumes of old and stale magma contra fresh hot volatile rich magma will decide what happens. If there is a lot of rhyolite and a little andesite the rhyolite will be benignly extruded in the form of a large lava dome and the newly arrived andesite will in turn rapidly degas and then percolate into yet another batch of stale rhyolite. If the respective amounts are more balanced you get a champagne cork effect, first a happy little rhyolite dome will extrude before it is blown to smithereens by the volatile rich andesite. If both of these volumes are large you get a pretty large eruption well into the VEI-6 range like the Ojos de Agua eruption. If the amount of fresh magma is larger than the old stale magma there will not be time for a dome extrusion, you just get very rapid inflation and then that part of the caldera goes off. This type of eruptions would produce a pyroclastic base surge covering everything fifty kilometers out to a depth between 1 and 20 meters. Currently there is not enough monitoring equipment in place to detect an upcoming eruption of this type, and due to the high population ratio contra routes of evacuation it is dubious if it would even be possible to get the population of Guatemala City evacuated. And, as monstrously as it sounds, even if you could evacuate the population there is no realistic place to evacuate 6 million people to. If an eruption like this occurs between 1 and 3 million people would die. The other version of supereruption is more normal, but with a twist. The caldera of Amatitlán has formed in a series of caldera forming explosive eruptions. Normally a volcano will do a large caldera collapse during an eruption and during later stages you have smaller intra-caldera eruptions transforming the large caldera into a nested caldera. Due to the intricate faulting of the Amatitlán Volcanic Complex you instead get intrusions running in under the caldera walls themselves and as pressure reaches the breaking point you get an explosive caldera enlargement. If you ride a boat along Lake Amatitlán you will see semi-circles gouged out of the caldera wall, one after another. Some in the VEI-6 range and a couple of them is in the 150 cubic kilometer range. If a large eruption of this type would occur Guatemala City would be a complete loss since the base surge would devour the city and cover it with between 20 and 100 meters of ignimbrites within minutes, there would also probably be a 50 percent loss of life extending from 50 kilometers to 100 kilometers. The death toll here would be in excess of 6 000 000 people. With the knowledge in geology and volcanology that we have today nobody would place the capital where it is. Still, there is a reason that both the Mayans and the colonial powers wanted the city where it is. The region is the most fertile in the world and the elevation produces a climate that is as near to perfect as is possible. There is a reason that Guatemala City is nicknamed “The City of Eternal Spring”. The coastal area towards the Pacific Ocean is very warm, so much so that only sun craving Swedes think it is a good spot to be at. And the Atlantic coast is even warmer and also infested with mosquitoes, which is sad since that would be the safest spot for the next capital city. The last large eruption occurred outside of the caldera itself and was of the champagne cork type. It happened on the way to Pacaya and it left a couple of nice hydrothermal lakes and this is the most likely source for the demise of the Mayan Capital. At the beginning of the article I wrote about things moving about in the Amatitlán Caldera, and this occurs in an area stretching from Ciudad Amatitlán all the way to Pacaya. Here hydrothermal springs and hydrothermal field’s crop up, hills inflate, beaches lift or sink and generally tend to refuse to stay in place as hydrothermal fluids move about and magma shifts around or intrudes. To me this is an area that is in dire need of instrumental coverage. Sadly Guatemala does not have the money for that and they have to use the money they have to monitor the more frequently erupting strato volcanoes around the city. I can understand and relate to the hard decisions the local agency has to do, but at the same time as both a geophysicist and a resident of this beautifully dangerous city I find it heartbreaking. I understand that the amount of equipment needed is just too much for the funding, and I can relate to the hard decisions made. But at the same time I know that it is really just a question of time before one of the larger eruptions comes knocking on the door, be it a flank collapse or an explosive caldera eruption. There is though hope, the local volcanologists are pretty sharp and there is a new breed of even sharper volcanologists in training (I know some of them and they are sharp cookies indeed). If they could just get their hands on a steady supply of equipment they would perform miracles. So, here is a wish list from me for the volcanologists of Guatemala. 10 complete borehole strainmeters drilled and ready. 6 complete gas measuring stations and 1 water chemistry station permanently located in the lake itself. 20 state of the art seismometers and 20 research grade GPS-stations. Or in other words, about half of what Iceland has. Yes, we are talking about a few million dollars or Euros here, but put that into relation of 6 000 000 people and the price per life would equate to less than 1 dollar per person. At the same time as we add Amatitlán Caldera and Guatemala on the New Decade Volcano Program on a shared second place I would also recommend going to Guatemala. It is a country of intense beauty, untold cultural riches and by gosh if the volcanoes are not outstanding both in beauty and in richness of its eruptions. I can’t think of a place on earth other than this where you are guaranteed to see eruptions while visiting a world heritage city with a drink in hand. It is the paradise for a volcano lover and for me it is my personal Garden of Eden, even though it has a large dragon at its heart. And in keeping with my tendency to do projections. 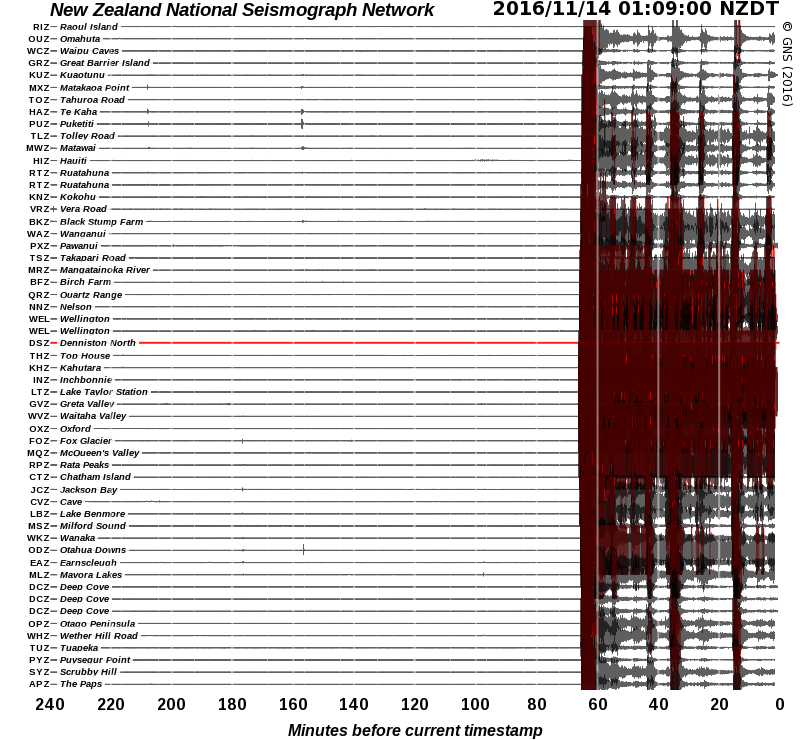 The moment tensor for the NZ quake appears to be an oblique fault. (Part strike-slip, part reverse fault.) I don’t have any modeling for that specific type, but a Mag 7.8 strike slip shows maximum displacement of about 10.09 meters, and for Reverse faulting, about 2.64 meters. The likely real value will probably be somewhere between these two values. This displacement would likely be in the vicinity of the actual rupture. While not actually part of the Alpine fault, it is related to the Alpine fault and the general motion of the area. My spreadsheet model is from data in Wells-Coppersmith. As stated in their paper; “Reverse-Slip relationships are not significant at a 95% probability level” so take my reverse faulting data with a grain of salt. 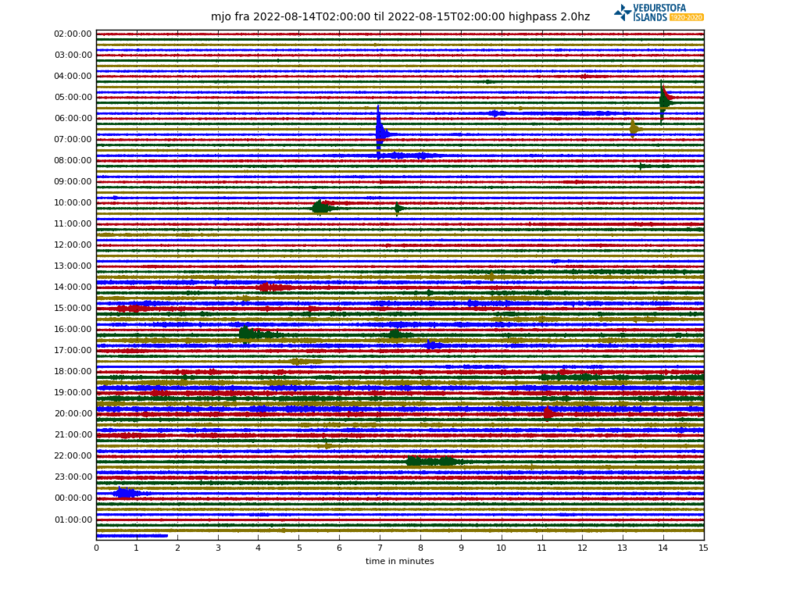 And thanks to the Internet, this quake actually woke me up this morning when my phone went nuts. I rolled over and took a peek at Volcano Cafe and saw that Carl had already noted it. Side note. USGS offers a notification service for quakes matching the parameters of what you want to be notified about. My parameters are for really large quakes and for smaller stuff in and around the New Madrid system. GL Edit: Fixed my broken link. The pdf is under the link now. 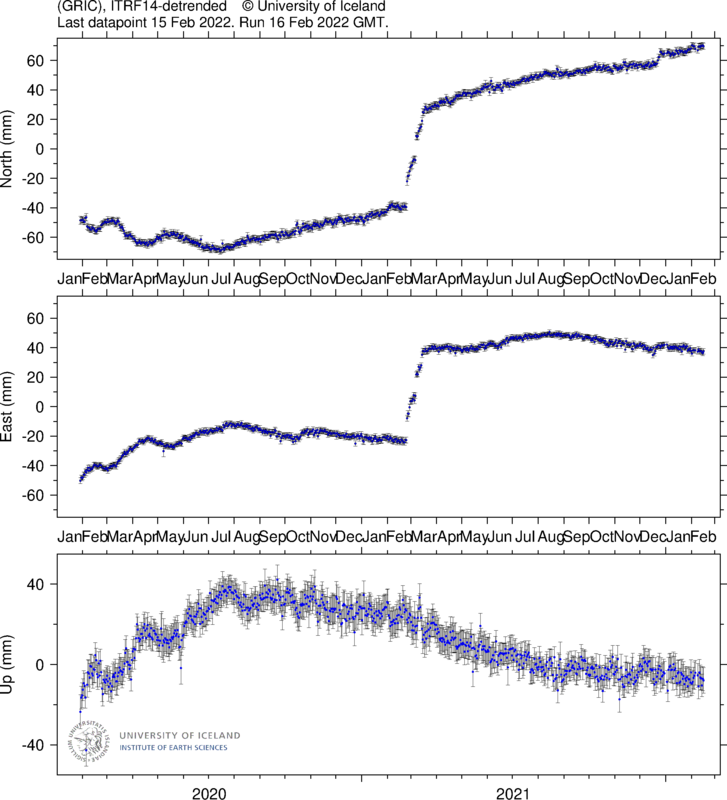 Geonet has the actual data, I just based my comment off of the beach ball that shows oblique motion. I can’t treat it as such so I picked the two modes that would yield it and hit the dual nature of it by accident. No wizardry on my part. The staff of Geonet have the training and the gear to make such a statement. All I have is insomnia and a large dog that wants a cookie. So to access the notification service I can go to the USGS web site? I’d like to keep track of the New Madrid system. Yepp, and then register for it. Thanks 🙂 Sometimes I can feel minor movement here & wonder if it’s my imagination. Years ago, there were a couple of times there was no doubt & local news reported it. Wonderful post. Been looking forward to something good about Amatitlan for a while. Personally, I have to consider that Agua would be a big risk to have a flank collapse event if it were to wake back up, at least bigger than some of the others. The reason for that being that it’s the tallest, steepest, and largest stratovolcano of the area, while also being dormant for a while. The dormancy is a potentially big risk since any renewed activity would be more likely to force up a more viscous dome, and it would also need to re-open the vent at the top. This type of activity would be similar to pushing a wedge up through the bottom of the volcano. The other candidates wouldn’t have this risk since their vents are already more or less “open” and any new magma wouldn’t have a similar wedge-like effect, although they are still inherently instable. I still wish there were more information out there on Agua. Looking at its profile, it doesn’t appear to be a particularly old volcano. It has a very conical profile, and there isn’t a huge amount of erosion, so it seems strange that there isn’t much information on it regarding past eruptions. It is actually not that mystical. It is a question about money to do the research. We do know that it is a holocene volcano and that it probably erupted up until quite lately. A guess would be sometime between 1AD and 1 000AD. One day I will get my arse up that volcano and take some samples. You’ve done it again! 🙂 Most definitely worth the wait. As the saying goes, quality over quantity! It’s still hard to imagine just how powerful these events would be, here’s to hoping it doesn’t happen for a very long time! Happy anniversary to you Carl and the whole bunch who make the Cafe such a nice place to visit! Please carry on wrinting all these beautiful and interesting articles/comments. It’s about Fast Radio Bursts. The phone bit is a headline joke. And this is how a rhyolite dome extrusion looks like in real life. As I described in this article the end stage is the hard thing to predict, since it is in Northern Ethiopia it should be basalt that is pushing that one up. But it could be explosive all the same if the champagne cork pops in the end. I would absolutely not stand around while that one is pushing upwards. I was wrong, it will be xenolith rich basanite that will be coming up. Injibara is a quarternary volcanic province that is littered with small calderas, so an explosive ends seems to be a clear and present possibility. And the name of the actual volcanic center is Tirba. Well, you found an event that happens about once every 100 years. And it happens to be a rare event that I described in exactly this article. I just hope for the onlookers sake that this does not turn into a caldera event, but geologic history suggests that it very well may become just one of those. What a catch! Well done to you, Ursh! Preferred location is 50km away uphill so that any pyroclastic base surge has to fight gravity. This dome extrusion is 400 kilometres away from the Ethiopian Rift system and 100 km south from Lake Tana. This volcanic district seems to have nothing to do with the rift system, but is it caused by a mantleplume? It is where the Tibesti rift comes meandering out on its way to the Red Sea. And our little rhyolite was not erupting now. Instead it ironically enough had a little side forrest fire making it look like it was extruding now instead of 100ds of years ago. This rock reminded me a lot of the Showa-shinzan dome at the Usu volcano near Toyako in Hokkaido, Japan. This was formed in 1944/1945 and is still smoking. I visited this place in June 2015. I made a video and though I did not intend to share it in this form (part of my own private holiday movie) you can see the unfinished product here. The video is unlisted ( so it does not end up in regular searches) , because it’s not finished but I do not mind if people for whatever reason want to share it. Keep up the quality. Almost every article is interesting and most of the time very readable for non-experts like me. Also the articles about Mars and Pluto were a treat to read. When I worked i Guatemala as a tourleader years ago (1990-2000 more or less) I climbed Pacaya regularly. It was usually a spectacle, but I always had to warn my tourists that the volcano was infamous for robbery. How is the situation nowadays? And in general,would it be possible maybe to have an article somewhere in the future about volcanotourism and the possible risks involved? What about White Island (to me that seems also a no-go though it has a thriving tourist industry I believe). Really depends on the video. Some “share” links just render like that, others you have to drop the URL from the browser address line. This one seems reticent to embed either way. (I tried both) It boils down to whether the WP engine can make sense of the link. I will answer the Pacaya part. Nowadays it is robbery free, but you have to pay a licensed guide a fee or you won’t be admitted onto the mountain. It is not a volcano I really recommend visiting since it is highly unpredictable. Even with all my knowledge about it and being careful that particular volcano almost killed me two years ago as it had a vulcanian blast just as I had left the active MacKinney cone. 20 minutes earlier and about 50 tourists would have died. Instead it just caused bruises and very brown pants on people. Fuego is a hard climb, but much better from a watching perspective. You climb Acatenango and then you look down into Fuego erupting, best view on the planet. You do need a guide to get up. Also safe from robberies. Santa Maria, the guides here are awful, they take risks that are not worth it and go way to close to this unpredictable volcano. Agua, there are no guided tours up there even though it is the easiest volcano to climb with good access roads. If you wish to go up you need to hire armed guards. It is the last of the Robbery Volcanoes. Or, one call me and check when I do the next expedition. I do give tours on occasion of the volcanoes in Guate. At long last! Just like you point out, Amátitlan was our original choice for #2 but with you hors de combat it turned out impossible to write something about it because of the almost complete lack of studies. Not that I didn’t try! In the meantime, Albert had turned up a number of suspects including one where a midsize VEI-4 could inundate a city of a million and a half within five minutes as a 25-metre high tsunami caused by the first explosions, something that has happened previously before the Spanish arrived, something that will happen again with a rather high likelihood of it being before the year 2115. A small correction though, Carl. I think you’ll find that it was a year ago (to the date) the we completed the NDVP by posting our #1, Ioto. Time flies, eh? And congratulations to the team who managed to keep such a vibrant and valuable site going for many years, and came up with the influential new decadal volcano stories. And the many readers and contributors who made it a success. so, but SOOO much better than whatshisname where you started, jon somebody. I am SOOO glad he got in a silly huff and caused volcanocafe to be born! No need to be harsh against jon frimann. He provided the platform from where VC could form. And he ran the the blog fine, In his own way and till this day. Carl le strange contributions, made Jons forum to grow really fast. When Eyjafjallajökull erupted his site exploded. Too much for one person to handle, moderation, off topic rules and so on. I think he just wanted to go back to his old fine site as he still runs it. With uptodate information about what is going on in iceland.. When bardabunga erupted VC had atleast 10-20 people working or helping, i quess? Moderators, pilots and so on. The split was needed and good for both sides. Jon’s blog is very good on current affiars and he understands a lot about Iceland. His blog has a very different purpose to VC but I highly recommend it. His post on the historical eruptions of Iceland is a classic. After reading this, as I normally do, I popped up google earth and explored the area (again) to look at the other nearby volcanoes. One volcano I had previously written off just popped out to me as a major risk. That being Izalco / Santa Ana. I suppose the reasons for me writing it off originally made sense – Izalco is a young and smallish volcano, and between that and Santa Ana, the historical eruptions have all been minor or gently effusive. But I didn’t look at what was below it. Apparently there are no less than 3-4 decent sized cities that sit directly below these volcanoes. So while a strombolian eruption or peaceful lava flow likely won’t cause much destruction, anything larger could be a major problem. One of the main issues as I see it is the risk for Lahar here. While a lahar wouldn’t likely cause an absurd MDE, the risk for major loss of life is frightening, since most of the cities sit directly on the lahar plain and close to the riverbeds. Naturally, any collapse, even a small one would be catastrophic. I would be curious how likely a collapse event could be at even a young volcano. The thing is, while Izalco is young, it is also quite steep already, and is probably large enough for something like this to occur given proper conditions. But that’s just pure speculation on my end. Realistically, Central america is loaded with extremely high-risk volcanoes with large population centers living extremely close to them. We talk about ticking time-bomb regions such as Naples, but if you were to account for an entire region, Central America simply has so many of these volcanoes that it’s almost hard to pick just one, since any one of them going off in a decent sized eruption would be a major catastrophe. They are saying multiple faults have ruptured in New Zealand. Latest info from @geonet on the #Kaikoura earthquake. Rapid recon indicates multiple faults have ruptured. Wonderful post, Carl: and pretty terrifying Volcano-watching from your own back garden is great, but might not be so good if one of the buggers popped up IN your back garden! Would you like to bet on whether one of our more excitable newspapers (Daily Wail, anyone?) now runs a story on the dangerous Guatemalan ‘supervolcano’? I know they have hacks monitoring this site. How about in a corn field? I would not be surprised if they did. I am totally fine with having Amatitlán in my back garden, the percentages is far more in my favor and I can read the seismos myself so I know if it will do something untoward. I am more afraid of the earthquakes to be honest. … and the local dingbats are stopping along Scenic Highway to take pictures of the blood red moon. The only thing a blood red moon means to me is that it’s Horde Night. Bit smoky down your way? Heard about the fires farther north..
rains now-had great weather until a couple of days ago..
Had dust in the construction zones on 331…. but no smoke. Not even the “hey there might be smoke” signs were out. FDOT is pretty sensitive about that nowdays. For anyone who wants to know, there is a volcanologist conference going on this week in Vancouver, WA. Earth lights in the NZ quakes? I’m still in the piezoelectric discharge explanation camp. Rock crystals don’t like to be broken. A very HAPPY ANNIVERSARY Volcano Cafe. Great articles, loads of knowledge, information, and learning. Five whole years! Happy birthday all! And thank you Carl for a lovely article and stewardship of our lovely café. And here’s to your health – I hope you stay hale and healthy. My wife is very jealous. She went to Guatemala for entomology fieldwork about three years ago and loved the place, though it was a bit hairy security-wise. Fuego was asleep at the time, and she’s unhappy it popped literally the day after she flew home, because she had been staying in a hotel in sight of it. I hope your house stays level and secure… Time to buy a tiltometer? A quick look at the ice core record shows one event around 435 AD, seen both in Greenland and Antarctica although it is stronger in the south. Other than that, there is no obvious major volcanic event around 400 when the old capital was abandoned. But how accurate are these dates? If more uncertain, even the 534/540 llopongo eruption comes into play. But around Guatamala city, there seems to be no shortage 0f possible culprits! What a place to build a city. What a good article for Volcano Cafe’s 5th year!